Scrap It Up is a non-profit creative reuse center. We are a place to find, donate and be inspired by a myriad of art, craft, and upcycled materials! Our mission is to encourage sustainable behavior and creativity by diverting materials from the waste stream for use as low-cost supplies in creative reuse projects. We are a diverse group of women who have come together for one purpose. We all have our own reasons why this is so important and we believe it is our individual strengths working collaboratively on one common goal that has made this possible. AND THAT COMMON GOAL IS? Encouraging creativity and sustainable behavior while diverting materials from the waste stream. 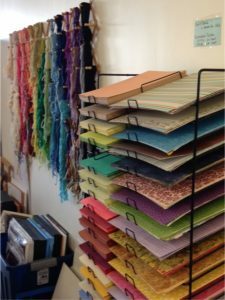 Scrap It Up is a resale shop, a place to find, donate and be inspired by a myriad of art, craft and upcycled materials. Anyone and everyone – including you! Need a nifty gift for your friend? Fill one of our awesome cigar boxes with treasures like stickers, stamps and sharpies! Got a science project due? You’ll find lots of materials to use with your imagination! Need some yarn to make a scarf? We have lots of yarn that’s lots cheaper than at your favorite craft store. We are located at 5935 Ridge Ave. in Pleasant Ridge, at the intersection of Ridge and Woodmont, across from Nativity School. You can park in the Pleasant Ridge Recreation Center lot closest to the store. DO YOU OFFER CLASSES OR WORKSHOPS? HOW WILL I KNOW WHAT TO DO WITH YOUR STUFF? We will be offering learning opportunities at our partner organization, the Kennedy Heights Arts Center, located nearby on Montgomery Road. We can also host smaller workshops at our shop. Please feel free to ask us for ideas of how to use various materials, or check our facebook page. EVERYTHING LOOKS AMAZING…..BUT CAN I AFFORD TO SHOP HERE? That’s the best part! Everything is priced very reasonably. We are not in this business to make money. We are a non-profit, and anything we earn goes back into the store. All of us volunteer our time and talents to make this project successful. We need volunteers. We need donations, we need buyers, we need people to help us sort and price, spread the word, and to assist us when the shop is open. Donations of cash are always welcome. Stop in, email or call us and tell us how you want to help.